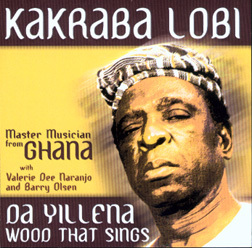 The Lobi Nation of Ghana and Burkina Faso and are expert at making wood to sing. The art of playing the gyil is one of West Africa’s guarded treasures, loved for centuries as a virtuoso art with tremendous healing powers. This, the trio’s 3rd CD, is a special edition of Kakraba’s personal favorites, never before recorded. Da Yillena “The Wood is Singing” – (trio with kuar) Kakraba wrote this peice before a concert last year (2001), saying “We should record this one today.